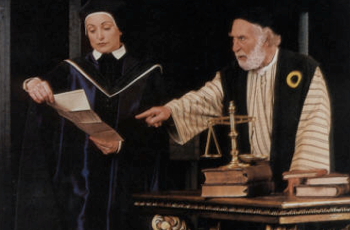 It seemed fitting in the trial scene of Act V when Nicolas Van Burek playing Gratiano accidentally knocked the scales off the desk of Paul Soles (Shylock). Soles was not able to put the scales back together and neither was his fine performance able to save a show knocked terribly off-kilter by the poor direction of Richard Monette. Only during the trial scene did any modicum of tension arise, but coming after four acts of tedium this was far too late. Anyone who saw Marti Maraden's highly intelligent production in 1996 will gain nothing from this new "Merchant". The main difficulty is that Monette's direction seems totally unengaged with the play. As with his "School for Scandal" in 1999, his rudimentary blocking has more to do with abstract patterns than with communicating characters' relationships. It is as if there were a large X across the Festival Theatre stage. In virtually every scene Monette lines up the actors along one or both of these diagonals. The character with the longest speech stands in the centre of the X to be replaced after a shuffle with the next character with a long speech. One notices this pattern within the first half hour. Two and a half more hours do not make it more interesting. Since the pattern is unrelated to the dramatic action, the effect is more like seeing a dull pageant than a play with any pretence to realism. The show gets off to a bad start with an underrehearsed opening where Bassanio explains his plight to his friend Antonio. It is so tentative the the set-up for the play's action is left unclear. Things get worse with the introduction of Launcelot Gobbo, who in fleeing his master Shylock debates his decision with his conscience played by a squeaky rag doll. I realize that Monette likes to include stuffed toys in every show he directs as a type of signature, but after thirteen years this joke has worn very thin. Monette's direction of Paul Dunn (Gobbo) seems inspired more by the slapstick of Sunday morning cartoons (including a whoopee cushion) than by Shakespeare. We reach the nadir of the show with the arrival of the Prince of Morocco, the first of Portia's suitors. Monette switches from a cartoon to a racial stereotype that not just Arab-Canadians will find offensive. Did Monette forget that this is a play about the evils of stereotyping? Why else would he ask us to laugh when the Prince bows to pray and bangs his head? Why does he have him belly-dance or brandish his scimitar and cry out like a samurai as if the Near and Far East were the same? With these antics and the impossibly thick accent he gives the Prince of Aragon, the meaning of the casket scenes--that we cannot judge by externals--is completely lost and the underlying seriousness of the play totally derailed. The ending with a spotlight on Jessica weeping at Shylock's fate would be good, but by then Monette's misjudgements have long since taught us to distrust the production. Good acting can seldom overcome poor direction. Unluckily, with few exceptions, the acting in this "Merchant" is only adequate at best. The major exception is Paul Soles as Shylock. Soles, making his Stratford debut at age 70, is playing the part originally meant for Al Waxman, who died in January. Soles is the only actor to give his character any realism or depth. While he does not project the same power and subtext that Douglas Rain did in 1996, he avoids any of the staginess of Brian Bedford in 1989. He portrays Shylock as an ordinary, imperfect human being whose daughter's elopement with a Christian motivates his insistence on having his "pound of flesh". It is sad that his interpretation should occur in such a poor production. Lucy Peacock gives a proficient performance as Portia, though without the nuance stronger direction could have provided. The love between her and Bassanio is so mismanaged that her aggressiveness in pursuing Shylock at the trial seems like unmotivated hatred. This makes her such a villain the comedy of the lost rings at the end doesn't work. Sarah Dodd (Nerissa) is excellent as her comic foil. In small roles Joseph Shaw (Old Gobbo) and Raymond O'Neill (Salerio) acquit themselves well. There are difficulties with all the remaining actors. Peter Hutt's Antonio is a one-dimensional bigot, filled with suppressed rage and little else. Donald Carrier (Bassanio) spouts Shakespearean syllables but communicates none of their meaning. He is such a cold fish, even when he wins Portia's hand, it is impossible to guess what Portia sees in him. David Snelgrove (Lorenzo) is bland and Adrienne Gould (his beloved Jessica) delivers all her lines with the same intonation. Brian Tree's Duke of Venice seems more a nonentity than a high authority. As Bassanio's friends Nicolas Van Burek (Gratiano) and Timothy Askew (Solanio) do nothing but shout. And the trouble with Paul Dunn (Launcelot Gobbo), Rami Posner (Prince of Morocco) and Tim MacDonald (Prince of Arragon) is not their acting per se but the imbecilities they are asked to perform. The show is at least lovely to look at thanks to Ann Curtis's period Venetian costumes. Her research has led to the inclusion of yellow roundels used at the time to identify male Jews. Kevin Fraser's lighting is generally murky, save for the odd spotlight, and his use of lights representing stars extending onto the walls on either side of the stage makes Belmont look more like Las Vegas. Loreena McKennitt's song settings are all pleasant, but the Middle Eastern motif repeated for every appearance of Shylock or Jessica soon becomes tiresome. Monette actually resorts to suspense music, just as in a movie, in an effort to supply the tension good direction would have done. Monette recently told the Toronto Star (May 12, 2001) that "the work we are doing here [in Stratford] is comparable to any other Shakespeare that's being done in the world--and probably better". Anyone who saw the Royal Shakespeare Company's four productions in Ann Arbor just two months ago and who then sees this "Merchant" will find Monette's statement ludicrous. Photo: Lucy Peacock and Paul Soles. ©2001 Stratford Festival.